Just ME: a very girly xmas. It's lawn fawn's holiday inspiration week! Ha. we're 20 shades of pink and grey with this card. I used that snowfall stencil stencil again, with the embossing paste and some glitter. I'm obsessed. The making frosty friends snow-girl is resting atop her mountain of shimmery pink snow, with only the girliest of little birdies for companions. I hope you like it! Sofia already claimed this one for her home-room teacher. I LOVE your card with the pinks and the greys!!! It looks so beautiful and cute and unconventional !!! I wish there was a video of its construction to share with us all the details! Have a great day! I'm not a big fan of pink, but your card is adorable!!!! 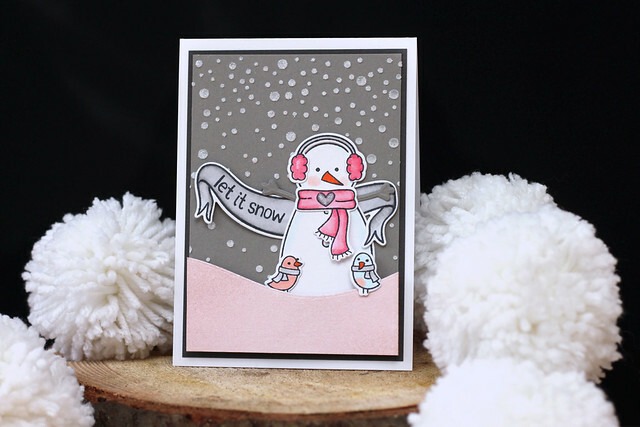 I love the falling snow, the way you colored the images, and the combination of grey and pink is perfect! Love it! This is such a cute and fun design! I love the color combination of pink and grey - so lovely! So cute and girl, but so sweet! You do girly well! I love the pom poms too! Ooo, I'm with your daughter-- loving the pink! I LOVE it!! Sofia knew what she was talking about! Beautiful. I adore the non-traditional colours. J'aime vraiment beaucoup ce fond de carte ! deerie me, it's almost December. To flash or not to flash? and a house-shaped tag. have a merry and *foxy* christmas.